Shape Shifting: Skrulls possess the ability to spontaneously alter their appearance to that of any living thing. Blaster Pistols: Skrulls typically carry a blaster pistol. 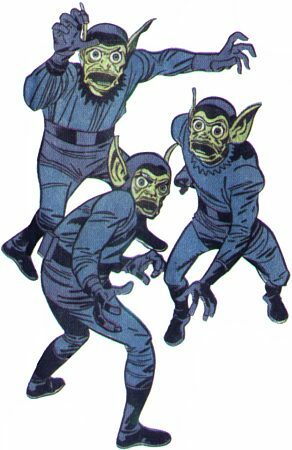 The Skrulls are a breed of green skin humanoids from the Andromeda galaxy. They are a fierce warrior race that have become one of the oldest surviving races in the known universe. In the beginning they were a peaceful, scientifically inclined race on Skrullos, a planet in the Drax system. Almost a billion years ago the celestials arrived and experimented on the Skrulls. They produced three races. The Skrullian Eternals were immortal. The Skrullian “normals” were capable of eventually rapidly evolving into Celestial-like beings. The Skrullian deviants were natural shape shifters. After the departure of the Celestials, the Deviants wiped out the other two groups. All living Skrulls are descendants of the Deviant line.